Reuters is an international company committed to delivering news and financial information in all major languages. The Unicode Standard is capable of representing all characters from all languages and its use can greatly improve multi-language program development. Java uses the Unicode Standard to represent all characters. Reuters have kindly provided this Applet for displaying Unicode. The Unicode Standard is capable of representing all characters from all languages and its use can greatly improve multi-language program development. Java uses the Unicode Standard to represent all characters. In the applet shown below (Java enabled browsers only) 256 characters of the possible 4096 are displayed in a grid. By clicking on the bottom and right sliders the offset of this character window into the Unicode character set can be changed. This version shows the 16-bit characters 0x0000 to 0xFFFF. It does not show the high 32-bit characters. For this Applet hybrid to work, you must click grant/accept/always run on this site/I accept the risk to give it permission to allow you to set the look & feel and to turn on anti-aliased fonts. If you refuse to grant permission, the program may crash with an inscrutable stack dump on the console complaining about AccessController.checkPermission. The applet was written by Nic Fulton in London of Reuters You can download the Java source. The slider at the base represents the first of the four hex digits of a Unicode character. The right-hand slider represents the second digit. The grid of 256 cells should show the 256 characters whose Unicode codepoints start with those two hex digits and the position in this grid makes up the third and fouth digits. If you click on one of the characters, it will be displayed in the box in the bottom right hand corner. Its full hex value will be displayed above it. The first 256 Unicode characters are based on ISO-8859-1 (Latin 1). 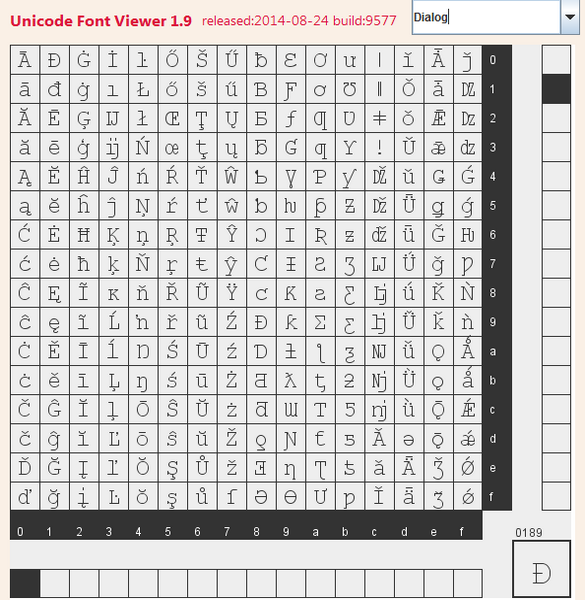 Many browsers are only able to display, in Java applets, these 256 Unicode characters. To test whether your browser supports more than the Latin-1 characters, try moving the sliders away from zero and zero. For instance, the ideographic characters known in Japanese as Kanji, in Chinese as Hanzi and in Korean as Hanja, start at U+4E00 (the Unicode Standard uses the prefix U+ to indicate a Unicode character). Place the bottom slider against 4, the right-hand slider against E and you should see lots of Kanji characters. Alternatively try setting the bottom slider to 0 and the right slider to 3. In this case some Greek characters should appear. Does your browser support the Unicode Standard? If you were able to see Greek (U+0370 onwards), Cyrillic (U+0400 onwards), Kanji (U+4E00 onwards) or other characters that were not in the first grid, then your browser does seem to support the Unicode Standard in Java. If you were unable to see any other characters that were not in the first grid, then your browser does not seem to support the Unicode Standard in Java, but you may simply not have the necessary fonts. However, if by moving the sliders nothing changed then it is likely that the Java Virtual Machine in your browser is chopping the top eight bits from each 16-bit Unicode character, leaving you with a Latin-1 character. This means that your browser does not support the Unicode Standard in Java. To see font samples in various colours of text and background see see the FontShower Applet. for the current version of Unicode. Displays full Unicode™ character set in any supported fonts. Originally from Reuters. 3.0MB zip for Unicode Java source, compiled class files, jar and documentation to run on your own machine either as an application or an Applet. access unicode source in repository with [Tortoise] Subversion client on wush.net/svn/mindprod/com/mindprod/unicode/. download ASP PAD XML program description for the current version of Unicode. Unicode is free. Full source included. You may even include the source code, modified or unmodified in free/commercial open source/proprietary programs that you write and distribute. Non-military use only.